The 30-year fixed-rate mortgage rate dropped a whopping 27 basis points this week. That’s the biggest decline in rates since 2009. As of this morning, the 30-year fixed rate average from Freddie Mac is sitting at 4.06 percent. A year ago at this time, the average was around 4.40 percent. There are other economic factors that are contributing to the steep decline in rates, and we will get to those in a moment. But what Khater touched on about housing demand is important to break down. Typically, a low mortgage rate average would have buyers salivating, but that doesn’t seem to be the case just yet. Low rates in February didn’t help pending home sales, which declined by 1.0 percent, a little more than expected. With fewer pending home sales you’d expect more inventory, which there is, just not necessarily in an affordable price range which has been the trend for some time. Home prices continue to slow their growth overall. The January Case-Shiller index showed the slowest home price growth in four years with just a 4.3 percent rate of growth as opposed to December’s 4.6 percent growth. Working against any inventory growth is the lack of new home starts. According to the Commerce Department’s report, new home starts of single-family homes have declined to nearly two-year lows. Building permits also dropped by 1.6 percent, but the silver lining is that permits are outpacing starts so that might mean more homes are coming they’re just a little slow to get going. It may not seem like it but overall there is a positive outlook for the housing industry this year. 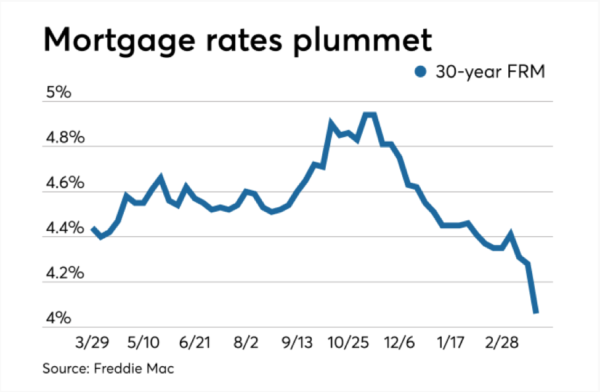 As we are now hitting stride in the spring buying season, it will be interesting to see how March’s numbers shake out with interest rates as low as they are right now, especially when it comes to refinancing. Like we mentioned above, the main contributing factor to such low rates, besides the Federal Reserve, is the general fear of a recession and slowing economy. Investors typically search for the safety of government-backed bonds when the economy slows. Last week the yield curve between the 10-year Treasury note and the 3-month Treasury note flattened and then inverted. That has not happened since mid-2007, just before the recession. Wednesday of this week, the yield on the 10-year Treasury dropped again, to its lowest since 2017. What brought that inversion back toward normal territory was news that the U.S. trade deficit had actually narrowed, with imports declining and exports rising, giving investors more confidence. It’s important to note, as Bloomberg points out, the 10-year and 3-month yield curve inversion has only been a key indicator of recession when it has been inverted for at least three months. Chicago’s Federal Reserve Bank President Charles Evans said earlier this week that while he understands investors are taking a wait and see approach, he contends the United States economy is still good, expecting growth around 2 percent this year. That’s in line with what was reported by the Commerce Department on Thursday. 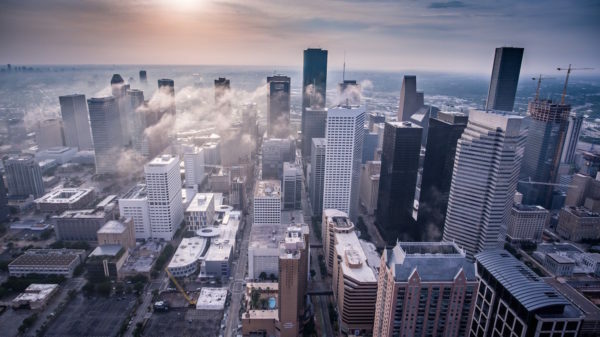 According to the data, economic growth became sluggish at the end of 2018 with just 2.2 percent growth in the fourth quarter. Full year growth remains at 2.9 percent. Economic growth is also expected to be stifled by declining consumer confidence and slowing job growth. The most recent jobs report showed February with fewer than expected jobs created. Also, data from the Conference Board, a non-profit research group, shows consumer confidence has taken another dip. However, this is once again a situation where you have to see where we are to give context to that decline. Look at the chart below from the Conference Board. 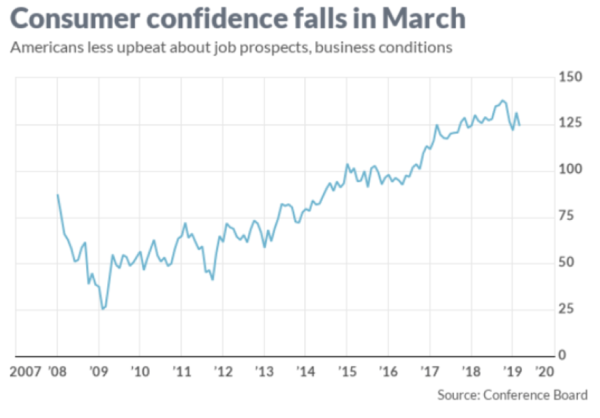 It shows consumer confidence levels from 2009 to now and clearly shows that the current dip is not even close to the low we saw just after the recession. Fannie Mae and Freddie Mac both came under government conservatorship after the companies received millions of dollars in government bailout money after the recession. Recently, the agreement has been the focus of much debate with many claiming the backing of the companies has allowed them to not face direct competition from the private sector. Fannie and Freddie combine to back more than half the mortgages in America. The Treasury Department will oversee the planning for Fannie and Freddie reform. Trump’s proclamation also called for further reform for the Federal Housing Authority, which helps first-time and low-income homebuyers. The Department of Housing and Urban Development has been tasked with the FHA overhaul.